We can all do our part for the planet. But will that be enough? The hard truth is, probably not. Here’s why: Even as you do your best to reduce your waste and reuse, recycle and compost as much as possible, the waste you see in your trash can is only a fraction of the problem—1/87th to be exact. For every can of garbage at the curb, there are 87 cans worth of materials that come from the extraction industries—such as timber, agricultural, mining and petroleum—that manufacture natural resources into finished products. Source: World Resources Institute. So even if we could make everyone's habits greener, that doesn’t address those 87 cans of waste that happened before we even see a product on the shelf. It’s not all up to you. We need to change the systems around us to prevent waste and protect our natural resources. 1) We extract natural resources like trees, precious metals and petroleum. 2) We manufacture them, often through polluting, toxic and wasteful practices, into products designed for the dump. 3) We distribute them, often shipping them long distances, from manufacturing to sale. 4) Here's where you come in, with few choices and opportunities to do the green thing. 5) After we buy and use them, we pitch our products into a hole in the ground (aka landfill) or an incinerator and destroy the value of those resources. When we need new products, we just head back to the natural resources like they’re in infinite supply. If everyone on the globe followed this system and consumed resources at the rate we do in the U.S., we’d need 5 planets to keep up. 7+ Billion People (and untold numbers of other species): In the past 40 years, our population has doubled and it continues to grow. 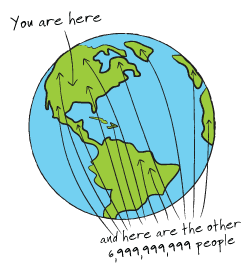 We’re all dependent upon a limited number of natural resources for survival. Climate Change: A rapidly changing climate will fundamentally affect the life of every global citizen (and species) including our water and food supplies, our health and beyond. The way we produce, consume and dispose of our products and our food accounts for 42% of all U.S. greenhouse gas emissions. Resource Wars: As quantities of resources like petroleum, minerals, even fresh water shrink, wars are being waged to grab control of the last of them. Future Generations: The resources we’re squandering don’t belong to us. If we can’t feed, clothe and house people peacefully today, how will future generations do so on far fewer resources? A Zero Waste System is cyclical, like in nature, and does two fundamental things: It redesigns our systems and resource use—from product design to disposal—to prevent wasteful and polluting practices that lead to those 87 cans of waste. It then captures discards and uses them, instead of natural resources, to make new products, creating far less pollution and feeding the local economy. New rules and policies that take a responsible approach to using and conserving dwindling natural resources. New manufacturing processes and smarter design where manufacturers are held responsible for the full lifecycle of their products, giving them the incentive to design for the environment, NOT the dump. New programs in every sector of our society to shift our culture away from wasting and toward a sense of responsibility for our planet and its future. Resource recovery infrastructure to replace landfills and incinerators and recover 90% or more of our discards. 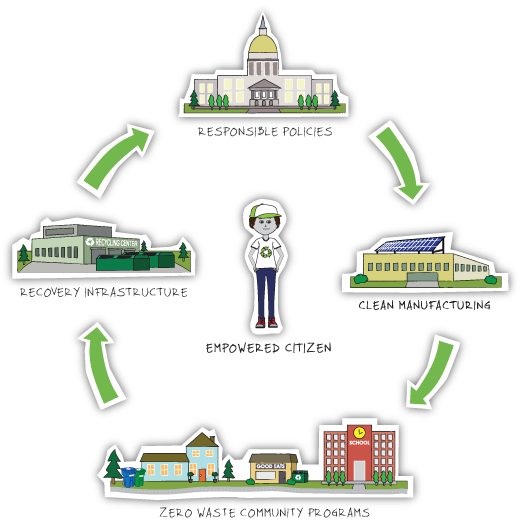 Empowered citizens like you who now live in a system that supports your efforts, while you continue to call for Zero Waste progress in your community. 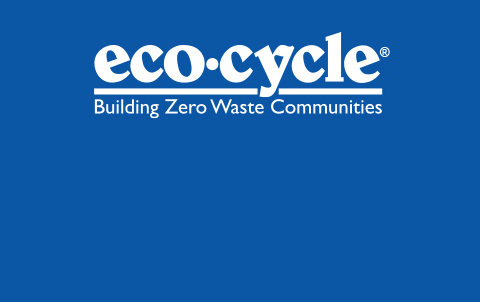 © 2012 Eco-Cycle, Inc. All Rights Reserved. No content published by Eco-Cycle may be copied or printed for any use without the expressed written consent of Eco-Cycle. Want to reprint or redistribute our content? Contact us.